FRUSTRATED BY THE lack of progress on social and political issues and reacting to the turmoil that had spread across the land, a number of groups began to advocate radical measures to achieve their goals of justice and equality. 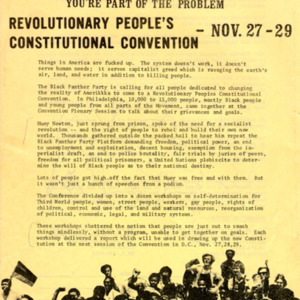 Four of the most prominent and successful of these organizations were the Black Panther Party, the Students for a Democratic Society, the Weather Underground Organization, and the Youth International Party, or the Yippies. The Black Panther Party was founded in 1966 in Oakland, California, by Bobby Seale and Huey Newton. They demanded the right to control the schools, medical centers, welfare programs, and police system in poor black areas, exemption from military service and the right to bear arms for self-protection. They organized chapters throughout the country, initiating 'liberation' schools, breakfast programs for children, and medical clinics in poor areas. 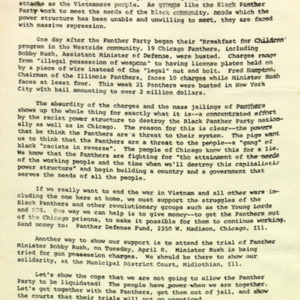 The Black Panthers had many confrontations with the police that led to shootings and arrests. 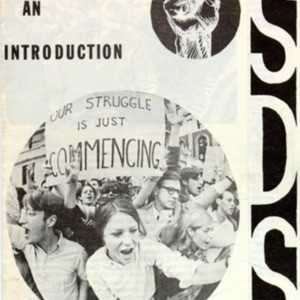 The SDS was founded in Chicago in 1962 and was active throughout the sixties on college campuses across the land. In the mid-sixties, they were active mainly in civil rights causes, but later they became more concerned with ending the United States' involvement in Vietnam. 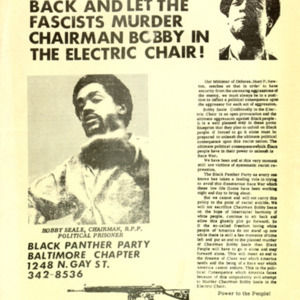 The SDS often coordinated activities with the Black Panthers and espoused radical, though at first, Marxist, means of protest. A splinter group known as the Weathermen believed in violent revolution and acts of terrorism to achieve their goals. This group was implicated in a number of bombings at colleges and federal institutions. 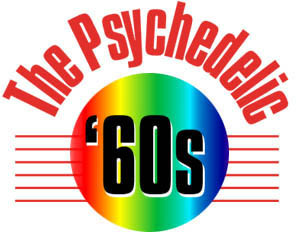 The Youth International Party (the Yippies), was the brain child of sixties activists Abbie Hoffman and Jerry Rubin. They staged guerrilla street theater designed mainly to attract media attention to their causes. They were most successful at the 1968 Democratic Convention in Chicago where they promoted the Yippie candidate for president, ­a pig named Pigasus. After the ensuing riots that rocked Chicago for days, Hoffman, Rubin, Black Panther Bobby Seale and four others were arrested for conspiring to incite violence and crossing state lines with the intent to riot. The group became known as the Chicago Seven. After a protracted trial, all charges were dismissed. Shown are various publications promoting the causes of these groups. Black Panther Party. Ministry of Information. 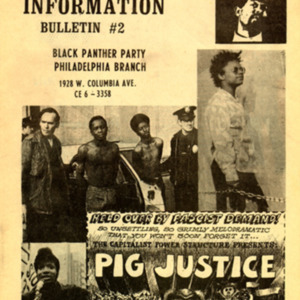 Philadelphia: Black Panther Party, 1969. Huey Newton. 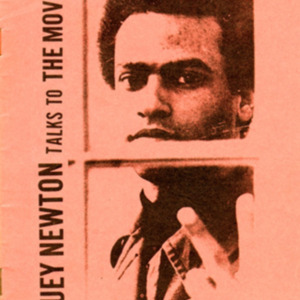 Huey Newton Talks to the Movement. Boston: New England Free Press, 1968. Black Panther Party. We Will Not Sit Back and Let the Fascists Murder Chairman Bobby in the Electric Chair. 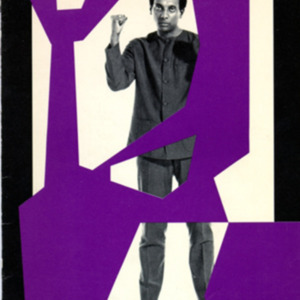 Baltimore: Black Panther Party, n.d.
Stokley Carmichael. The Pitfalls of Liberalism. Wash. D.C. : Mrs. Mabel F. Carmichael, Exclusively distributed by Koko, 1969. Black Panther Party. 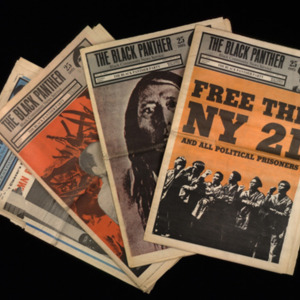 Black Panther Newspaper. San Francisco: Black Panther Party, December 7, 1968. Students for a Democratic Society. SDS: an Introduction. Chicago: SDS, n.d.
Students for a Democratic Society. The Struggle of Freedom in Chicago and Vietnam. Chicago: SDS, n.d. Weather Underground Organization. Osawatomie. 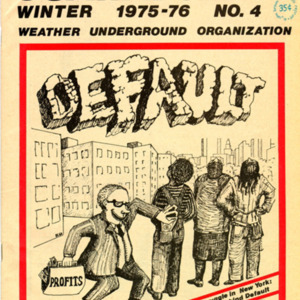 Seattle: Weather Underground Organization, n.d. Youth International Party: Yippie! New York: Youth International Party, 1969. Walter Schneir, ed. Telling it like it Was: the Chicago Riots. New York: Signet Books, 1969. 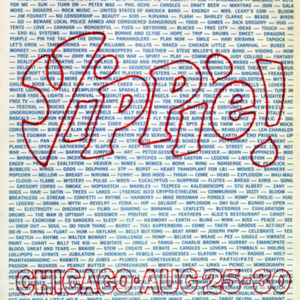 A NUMBER OF writers came to Chicago in August 1968 to witness the demonstrations that promised to disrupt the Democratic National Convention. 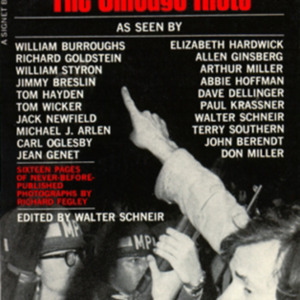 Many of those in attendance, such as William Burroughs, Allen Ginsberg, Terry Southern and Abbie Hoffman, became unwilling participants in the rioting that broke out when the police attempted to clear Lincoln Park on August 30th. Thousands of protesters took to the street, and many were arrested, including Bobby Seale, Abbie Hoffman, Tom Hayden, and Jerry Rubin. Television images of the police brutally beating the demonstrators awoke a sense of unease among many viewers. Abbie Hoffman. Steal this Book. New York: Pirate Editions, 1971. WRITTEN WHILE SERVING time in jail, Steal this Book is an irreverent "manual of survival in the prison that is Amerika." Hoffman gleefully dispenses advice on marijuana growing, beating the draft, getting free land, guerrilla radio, even making molotov cocktails, as well as providing lists of free clinics, clothing outlets, food kitchens, and places providing draft counseling. 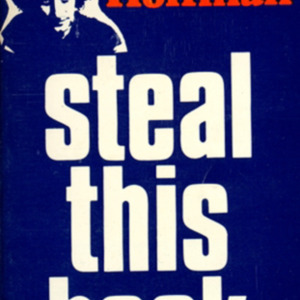 The editors of this particular edition took Hoffman at his word and did literally steal the book. This edition is pirated.